Why should I choose cedar roofing? Cedar roofing is an environmentally responsible choice. It’s renewable, recyclable and sustainable for generations. It is also an excellent insulator and can withstand extreme temperature changes. Real wood drastically increases curb appeal and gives your home a true “Northwest” look. You can go with the cabin pre-stained look or the modern clear cedar roofing. Lastly, you will be confident to know that cedar roofing is tested more than any other product on the market today to insure it will be a safe, durable covering for your biggest investment. Cedar Shingles are a more precisely milled material than shakes. They provide a refined classic appearance and give the home a more uniformed modern feel. Shingles are sawn from blocks of wood and are tapered with a smooth surface. They are the same thickness all the way through unless they are custom made. 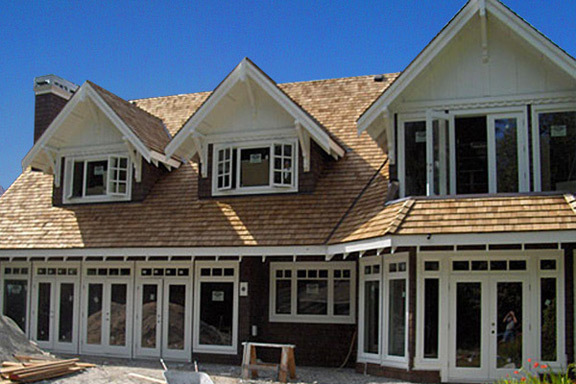 Shake roofing installations provide a natural look that many people find more appealing. While cedar shingles are sawn to have a smooth/uniform surface, cedar shakes have been split from the wood and are less uniform in appearance. They are also thicker and are rough sawn on the top surface. There are too many options and too much information to list here. Before deciding whether or not a shake roof is best for you, give us a call. We have the knowledge and experience to assist you in making the best decision. Click here for cleaning instructions.